A weak distress signal has been detected coming from a small moon orbiting the planet Ateria. You have no choice but to respond and render help. The only question is, who is it that really needs help? While it is not required, we HIGHLY recommend that you play atmosfear 1 before playing part 2, as it is a continuation. 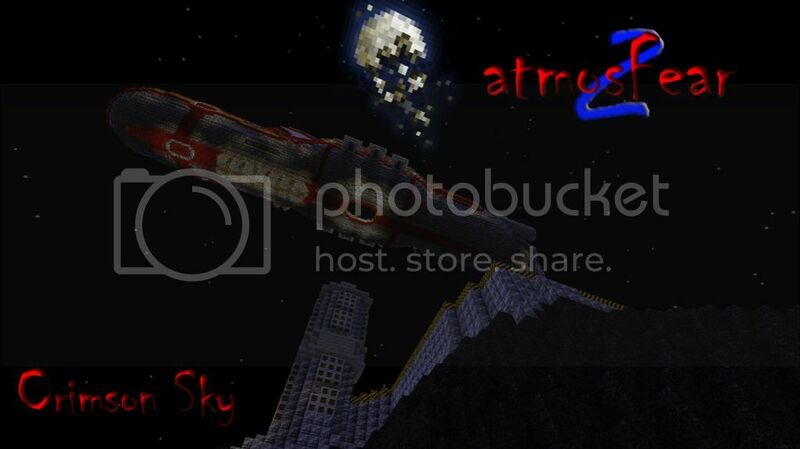 atmosFear 2 is an adventure style map. Single player is recommended but it can be played as multi-player as long as you aren't using voice communications, as it sometimes interferes with in games sound you must hear. This is a one of a kind map using new and old methods to bring together a challenging and scary game. Three main things you need to know to play this map properly. 1. You MUST use the resource pack provided in the download. 2. Command blocks MUST be enabled. 3. NEVER play in peaceful mode. The map has been tested for bugs and errors but we know things still happen, so if you experience any issues, please post it and we will attempt to address the issue. Feel free to leave any comments or questions concerning the map. If you have issues opening chests when playing on a server, please make sure spawn protection is turned off. This map was created by the atmosFear Team! Looking forward to playing this with CDFDMAN next weekend! Awesome! Can't wait to see your adventure! We all love watching your videos. Ah. Nanites. How we missed thee. 2.5 hours to complete the map with 3 players. Will have some footage and/or review in a few days. In space, no one can hear you cook. Except the nanites. In this map, you are left behind on a spaceship while the rest of your crew beams down to a moon with a mysterious call for help. The ship itself is well detailed and contains many humorous wall signs/paintings. Think; the enormous ark ship from Wall-E. Which means that the majority of the map is navigating an enormous open-world ship, performing a series of scavenger hunts, which seem further and further paced apart the more confused you get in the layout of rooms. There are some clever mechanics and effects here; weightlessness, oxygen management, fixing breaches in the hull, and transporter room mayhem, the voice-acted clue books. From a challenge perspective, there is a sequence of running from mobs (you can't hit), a very small bit of parkour, the aforementioned navigation, and every 2 minutes you will be faced with an annoying swarm of nanites (endermites). We played this with 3 people, which helped shorten the scavenger hunts, but it still took 2.5 hours and we really struggled to not give up for the increasing feeling that we were lost. I wanted to let you know that I revised my review summary text (above). The first review stressed 'lack' of direction, but that wasn't 100% accurate. We were given direction, but FELT lost due to the size and complexity of the ship's layout - often running back and forth through the same rooms. Apologies for the initial confusion. I wrote that fresh in the aftermath of playing, but now I've had more time to consider what actually contributed to our feeling. I still stand by the original numeric rating. Make the very first quest through the ship more linear, possibly locking doors until you get to the bridge, and then opening them up. Possibly in some path that helps reinforce the layout of rooms to feel less overwhelming. At some point after the first quest, give the player a hand-held map of the ship that they can reference - I feel like this would make a huge huge difference. I realize this might be hard to fit in one in-game map, since the ship is so big. But you could maybe do a reference version - for example not show every room, but color-coded sections of the ship. And add a key, e.g. Section 1 contains rooms x y and z. so the player may not know the exact pinpoint locations, but at least be in the vicinity. If you wanted to get really creative... You could have 5 different maps (I'm just using a representative number 5, not sure how many you would split it up into). The player is given a particular map with a red outline or dot in their current section, then when they pass a certain doorway (pressure plate door) that map is replaced in their inventory with a map with the red 'you are here' marker in a different section. This map would have been a 20/20 but the storyline was lacking. Gameplay was simply brilliant. It was easy to navigate, I knew right where I was going the whole time. There was never a question of being lost. It was almost as if it were scripted. Linear to the extreme!! OMG the effects were phenomenal, did you see the epic use of fireworks? There weren't many builds but what builds were there were astounding. The house on the hill actually had 2 floors!!! Experience, well it's hard not to admit that I am for sure a better and more experienced player now that I have conquered this map. Challenge was everything I expected and more. This map had elements of parkour, puzzle, adventure, not to mention the epic boss battle at the end. I wasn't sure I could defeat him with that minion he had running at me constantly. Pacing, well this is the perfect length of a map for me, I was able to finish it without much thought and before I finished my tuna sandwich I was having while playing!! I highly recommend this map for anyone wanting a map that basically walks you through itself with no thought having to be conveyed on your behalf. Excellent, now I have to finish this sandwich. Thanks to the mapmakers, maybe we can collaborate for part 2!!! CALL ME!! This was made in jest with no offense intended!